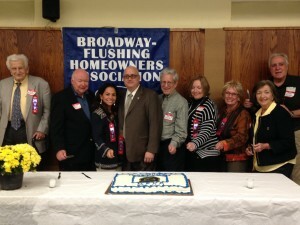 A half century of service to the community was recently celebrated by the Broadway-Flushing Homeowners Association (BFHA), when members, friends, guests and past presidents filled the auditorium of The Church on the Hill in Flushing, the site of hundreds of BFHA meetings over the past 50 years. The event included the presentation of several citations by elected officials and a ceremonial cake-cutting by nine presidents. 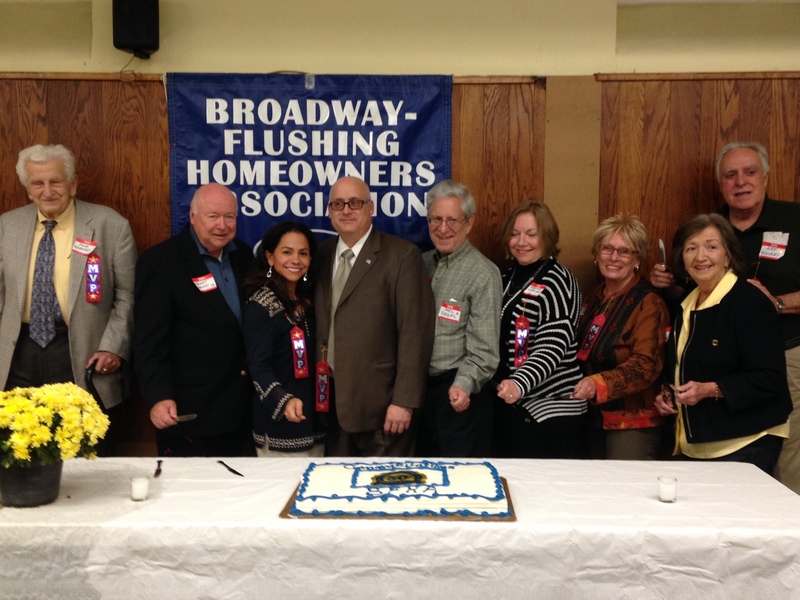 Nine smiling presidents of the Broadway-Flushing Homeowners Association cut a special 50th Anniversary cake at a recent gala meeting at The Church on the Hill in Flushing. The presidents who were able to attend the gathering are part of 28 uninterrupted terms of service since 1964. (L. to r.); John Kearney, Robert Hanophy Sr., Janet McCreesh, Robert Hanophy Jr., Mel Siegel, Marianne Giacalone, Sandi Viviani, Anne Mullaney and Arthur Viviani. There have been 28 uninterrupted terms of office since the founding in 1964. Officers have included lawyers, accountants, teachers, judges and homemakers – all volunteers concerned about the quality of life in their neighborhood. Association meetings have featured representatives from the police, fire, buildings, city planning, sanitation and parks departments, the Botanical Gardens, Queens Quiet Skies, Community Board 7 and Borough Hall, as well as members of Congress, state senate, Assembly and the City Council. There was an interesting bit of history played out at the meeting when Captain Thomas Conforte, recently appointed commander of the 109th Police Precinct, served as guest speaker; Captain John Sullivan, commander of the 109th Police Precinct in 1964 was the association’s very first guest speaker. 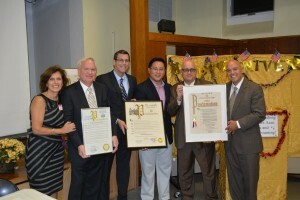 During its 50th anniversary celebration, several new citations were added to the very large collection that the Broadway-Flushing Homeowners Association (BFHA) has earned since 1964. 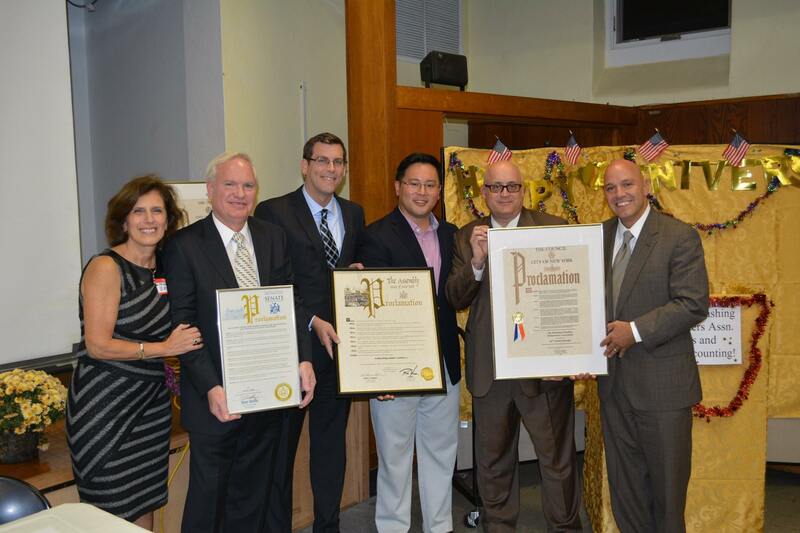 (L. to r.); Maria Becce, BFHA officer; state Senator Tony Avella, District 11; Assemblymember Ed Braunstein, District 26; Assemblymember Ron Kim, District 40; Robert Hanophy Jr., BFHA president and Councilmember Paul Vallone, District 19. The organization’s primary mission has been the preservation and protection of the Broadway-Flushing community from illegal conversions and zoning violations. The area’s Rickert Finlay Covenant has been repeatedly upheld in court cases over the years, including precedent setting decisions for the city. Hallmarks of the group have been the sponsoring of candidates’ nights, a continuing fight against graffiti and the annual presentation of awards for beautiful gardens. In 2006, the U.S. Department of the Interior and the New York State Register placed Broadway-Flushing on the National Register of Historic Places. Many homes in the area display historic plaques with this designation.